But! The fact that I rarely find these buttery, spongey, nuggets of delight doesn’t stop me from dragging the kiddos out to hunt for them several times every May. I enjoy a nice walk in the woods as much as anybody, and little Mack and Amalia are sweet to go with me, with proper inducement (“Yes, we’ll stop and get ice cream afterwards”). We found lots of interesting things, including some that were edible, but no mushrooms. Not this time. The first thing we notice are the nettles, which, of course, can be thrown into smoothies, steamed, or tossed into stir-fries. They are nutritious, but if you pick some, remember to use gloves, or you’ll get prickles and you’ll never trust me again with all this wild foods malarky. Unfortunately, we weren’t thinking about nettles when we impulsively grabbed bags and headed out for an afternoon of mushroom hunting. 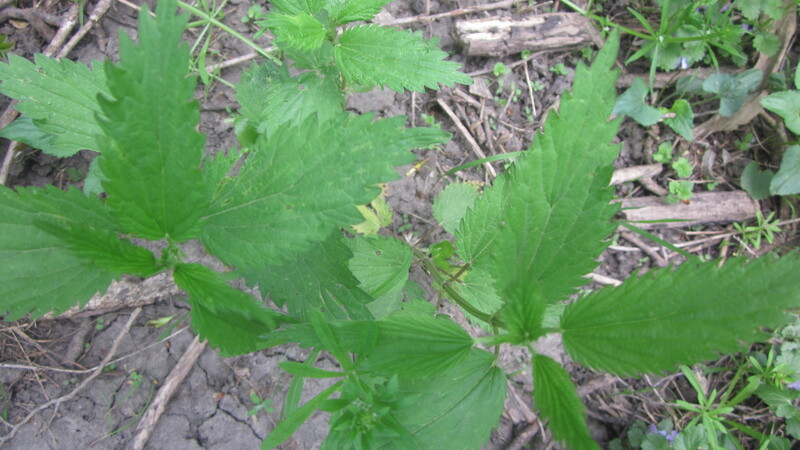 Nettles were everywhere, and there we all were, wearing shorts and open-toed sandals. Yikes! Don’t touch these dainty prickly leaves–eat them, just don’t touch them . . . .
No matter. When little Mack complained about some prickles on his legs, I cautioned him against scratching the stings. About that time I started noticing prickly feelings on my legs. Ouch. I decided that if I found a nice mess of ‘shrooms, it didn’t matter how prickly my legs got. So I just kept looking. And I didn’t scratch. Then I saw the violets. Did you know that violets are edible and are quite delicious? Here’s a recipe, in fact, for violet syrup which is fun to make, and even more fun to dribble on your ice cream. Such a delicious color, to boot! Oh, I dearly love this color of violet . . . it’s . . . a real violet, isn’t it? It’s a prettier, richer color than most of the pale bluish violets around our place. This is a fun and easy recipe for Wild violet syrup, if you happen upon a lot (a lot!) of violets in your woodsy rambles this spring or summer. It’s light and sweet and very, very beautiful. You may need help to pick this many violets, although (I remind little Mack) picking violets is much more pleasant pastime than, say, scrubbing the toilet. He agrees. 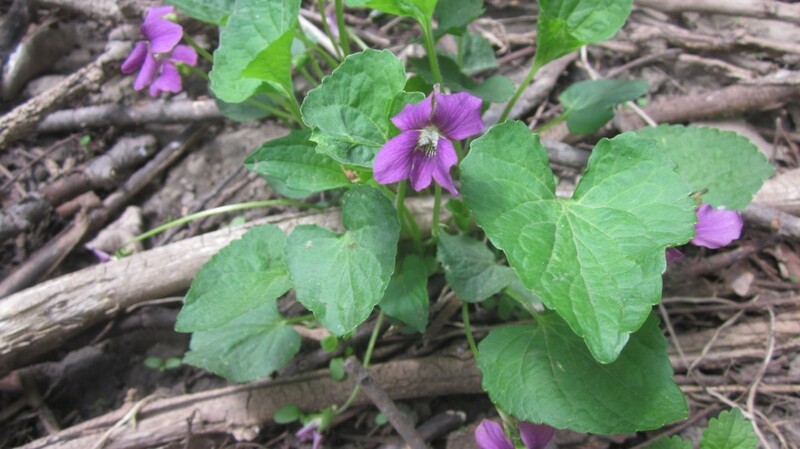 Here’s the recipe for Wild Violet Syrup. Pack a 1 quart canning jar with fresh violet flowers–the more tightly you can pack them in, the better! Add 4 cups (nearly) of distilled water and 2 tbsp of vodka or rum (40% or more). Seal jar and infuse for 24-48 hours – shaking a few times each day. Strain, squeeze remaining liquid from petals and throw the petal pulp to the chickens, or add to your compost pile for a lovely spot of color there. Heat until just boiling, and stir in 1 part sugar per 1 part violet infusion. Remove from heat as soon as sugar melts completely. Cool and add 1 tbsp of vodka or rum per 1 cup of liquid. If you only heat the infusion long enough to melt the sugar, you should be able to preserve the lovely color of the violet syrup, so be alert to when the sugar is dissolved! Now that you have this gorgeous violet syrup, what can you do with it? You can dribble it over your pancakes or waffles, or over shortcake (adorned with violet flowers, of course) and fresh whipped cream. Or you can add it to soda water to make violet soda pop–or think about how gorgeous it would be poured over vanilla or coconut ice cream! The mind reels with violet-adorned food possibilities! My mind was reeling with possibilities, as I picked and stuffed violets into my bag, when I noticed that all-too-common woodsy parasitic vine, poison ivy. I froze. Yikes. 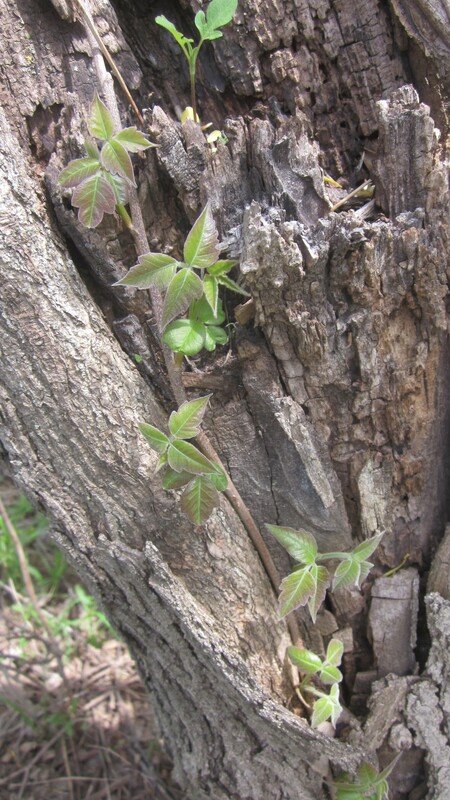 It was everywhere: poking out of the ground, its immature leaves still a bit purple in their infancy, climbing up trees, tumbling over the path. 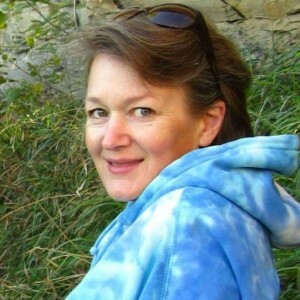 I’ve suffered with my mom every summer when she happens to brush against poison ivy–despite her best efforts to stay away from it–so, although I’ve never had a reaction to poison ivy myself, I try to stay away from it. Yikes! Poison ivy! Here it is just coming out on this tree. It’s an attractive vine, actually, but very toxic. And here I am, taking a close-up picture of it. For all its toxic nature, poison ivy is a fascinating plant. Did you know that it’s related to the mango (Anacardiaceae) and that the sap of the mango tree and skin of mangoes has a chemical compound similar to urushiol? But enough about the toxic plants around me. I’m excited when I spot some gooseberry bushes. Gooseberries, for the un-gooseberry-aware of you, are little wild green berries, very tart and flavorful, and the primary component of (you guessed it) gooseberry pie. I really want to make a couple of gooseberry pies this summer. It’s a lot of trouble–you have to pick the berries, first (braving nettles and poison ivy, natch) and then you have to pluck all the stems off the berries, before you even get around to rolling out the pastry. But a good gooseberry pie is worth all that trouble, in my opinion. On the other hand, maybe I’ll just pick the berries, and ask Mom to make me a pie. Her pies are always better than mine, anyway (hint, hint, Mom). I’ll bring the ice cream! 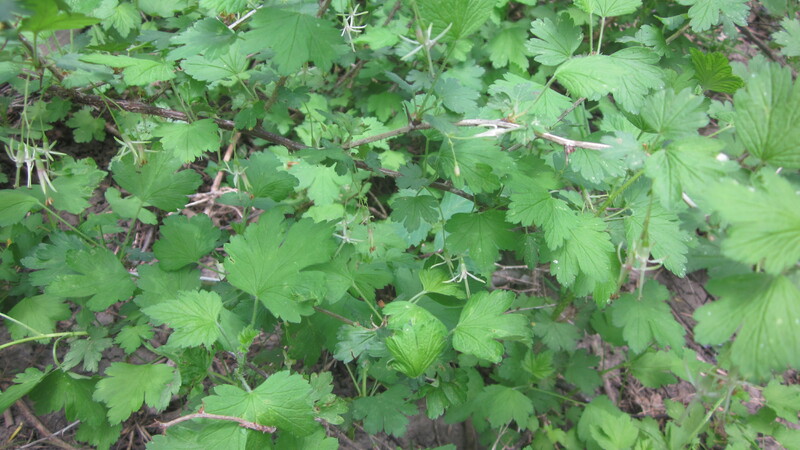 Finding these gooseberry bushes = promise of gooseberry pie! There are plenty of chokecherry bushes in the depths of these woods, too, and that’s a nice find, since our county road crews tend to spray poison all over the ones that grow wild along the road near us (don’t get me started!). (Maybe I ought to trudge out to the road, a nice slice of homemade bread, slathered with a thick layer of sparklingly-beautiful, purplish-red chokecherry jelly (one of the most delicious things you can make, I promise! ), and offer it to one of these county guys who spends so much time spraying the wild plum and chokecherry thickets along our road, with wild and thoughtless abandon. Maybe he’d find an excuse to leave a few, after that. 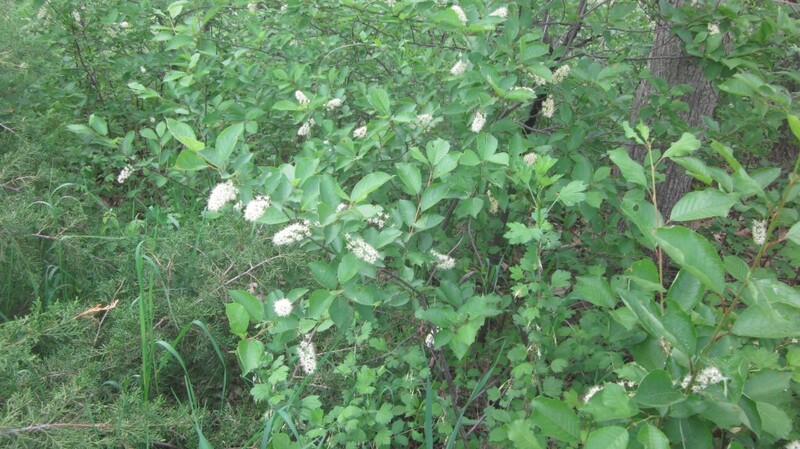 You can recognize the chokecherry bushes from the sprays of flowers, which will soon be replaced by berries. Chokecherries have a sour/bitter taste, but combined with sugar and made into jelly, are delicious. You can also make the juice into wine, or syrup, too. The berries are loaded with antioxidants, and were the most important fruit to the Native Americans, in fact. 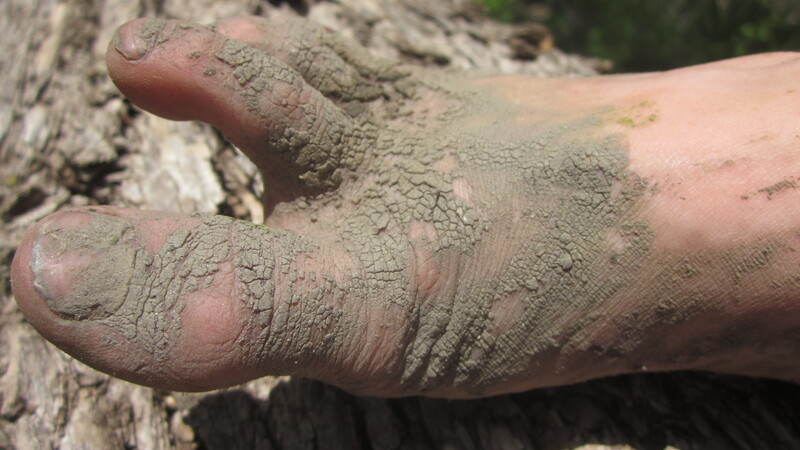 Not only did they eat the fruit, but they used the bark of the root to make a concoction that they used to treat or ward off colds, fevers and stomach maladies. It might be an interesting experiment to make some of this, myself, but this summer I might be too busy picking gooseberries to get to it . . . but then, who knows, maybe not? I continue to follow little Mack along the trail, as he chatters happily. 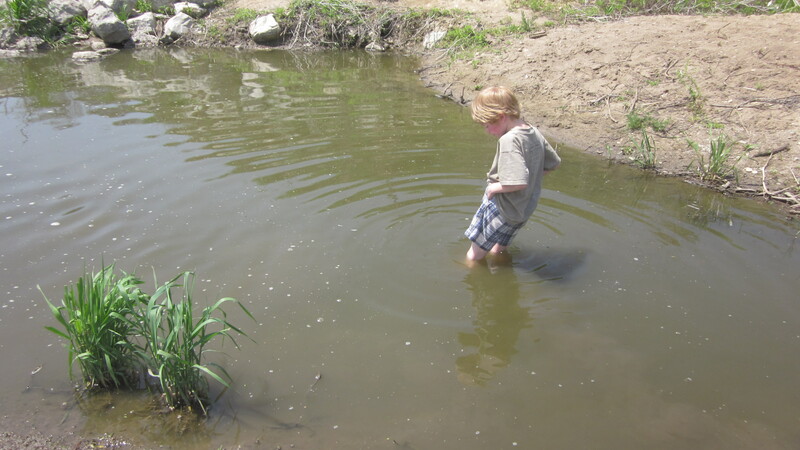 He is looking forward to the weekend, during which we are going to pack up a tent and fishing poles and graham crackers, marshmallows and chocolate, and go on a fishing trip to celebrate his 7th birthday. Gulp! Is he really going to be 7?? I don’t let on, but I bought a Swiss army knife just a couple of weeks ago and it’s already wrapped up in a package and hidden in my room. He is going to be so happy. The next time we go on a ramble in the woods, he’ll be carrying that knife in his pocket, I reckon, and this thought makes me smile. The path disappears, and we have to forge our own. 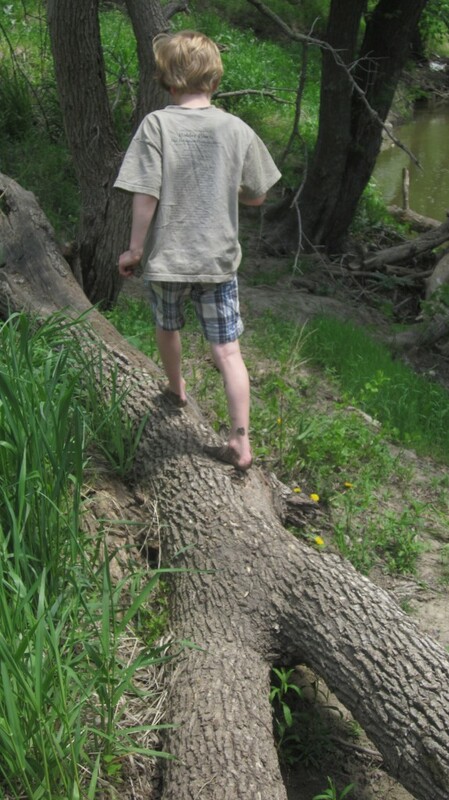 We have to wade through the muddy edge of the river, which bothers little Mack not a whit, Amalia–maybe just a little. The cool mud feels good on my feet. I’ve decided, by now, that the ‘shrooms are not out today, and my legs are stinging from repeated assaults by the infamous nettles that I keep brushing against. We get to the end of the trail and turn around, wending our way back. Of course little Mack wants to get into the water, even though the temperature must be only slightly above freezing. I wade in with him. The nettle stings burn like fire on my lower legs. Brrrrr! . . . and ouch!! “I’ll bet this is how the Native Americans treated their nettle-stings,” I say, letting my feet and ankles sink down into the icy-cold mud. Within a few minutes, the itchiness and burning is gone. My feet and legs are numb from the cold, instead. The rocks along the banks of the river are so pretty. When we travelled to New Zealand a couple of years ago, we found a little area along the ocean that was surrounded by large rocks, and was a catch-all for the shells that get washed up every day. It is called “Shell Beach” because everywhere you step, there are shells, probably several feet deep. It’s delightful, and beautiful. 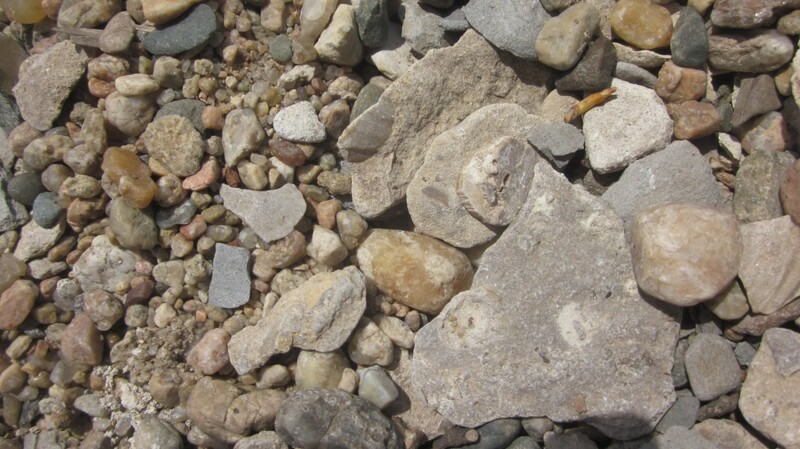 I decide that the rocks along the Big Blue are almost as pretty. “Rock Beach” it is! 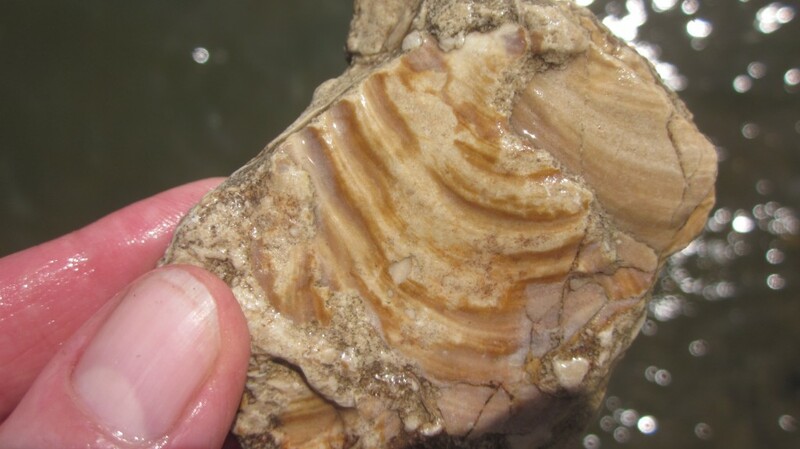 This river is also rich in fossils, everywhere you look! Amalia makes a delightful discovery: this little pile of feathers. We marvel at them. 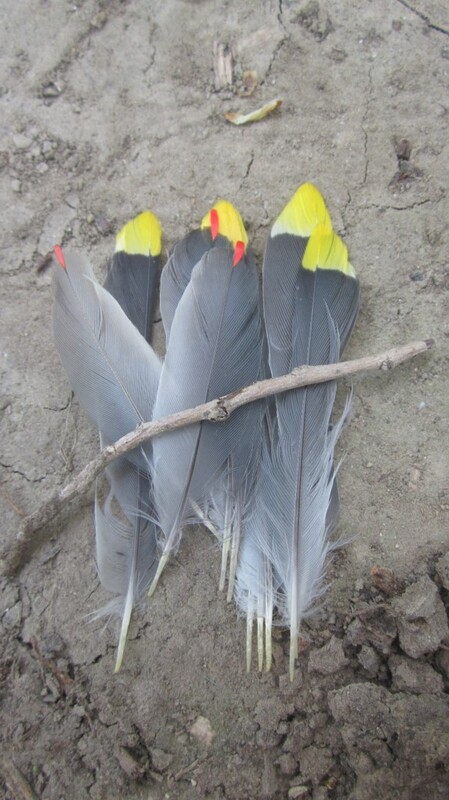 We have no idea what bird they came from and determine to do a little research when we get home. The shadows are getting long, and it’s time to head back home, our bags full of violets and fossils and pretty rocks and unusual feathers . . . everything, in fact, except mushrooms. Oh well. I really don’t mind, and I don’t think the kids mind, either. I couldn’t believe these feathers: what jewels! What bird did they come from? Oh well. I really don’t mind, and I don’t think the kids minded, either. We had some fun, we made some delightful discoveries, and we didn’t go home empty-handed, either. Score. That’s a terrific idea. I actually have parts of a rock tumbler out in our shed, that I had as a child, but I have no idea if it’s all there. Probably not! But maybe I’ll send little Mack out today to find it and we’ll see if there’s any way to make it work. Although since his birthday camping trip, Mack is really just excited about getting out there and FISHING again, especially now that he has a Swiss army knife! I don’t know how interested he’ll be in the rocks . . . ah well, maybe when the fish aren’t biting! Great post! Violet syrup sounds quite intriguing actually, although I’m not normally a fan of anything like that as I’d probably find it quite sickly! This sounds like such a fun day! I am not an outdoor person, but I love reading about other people’s adventures! You know, if this were a commercial product, the names would have to change. Something can’t be violet anything when it’s barely the fifth most prominent ingredient (not counting water)- with sugar, alcohol, etc. I find it ironic that you used “hamburger” as your example, since–as you are full aware, I’m sure–hamburger is actually “ground beef” and contains no ham and not a single burgher (to my knowledge). What a great ramble you shared today. I’d never even seen poison ivy before so thanks for that great picture of it growing in a trunk. The violet syrup sounds wonderful. How can you bear to soak the tiny, shy heads that way. They’re so beautiful. But I guess the end result is worth it. 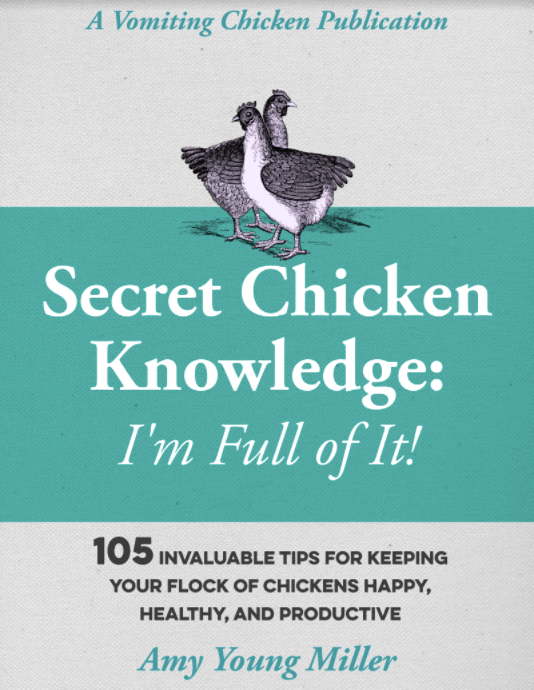 The only way I can do it is with the knowledge that there are lots (lots!) more violets out there! Those are wonderful finds, Amy! I’ve never heard of making syrup out of violets, but it sounds delicious. Those feathers are spectacular, I hope you share who they came from if you ever do find out! Suerae, I’ll post the answer to what that bird was, as soon as we figure it out! What a delightful tale of adventure and wonder! Keep them coming! Violet syrup? Amy, you keep us thinking! Come on over sweetie, and I’ll share some with you! What a beautifully written adventure. I was more and more excited as I kept reading. I cannot get over those gorgeous feathers. What a true gem. What an amazing place to live. I am sure you children are forming some wonderful memories. Thank you for sharing. Courtney, what a sweet comment. Thank you so much, and I’m glad you enjoyed the pictures, too! I’m glad you enjoyed our ramblings with us! Yes, I homeschool our kids. It has been a great decision for us, and–as of this fall!–we’ll only have two kids at home–Amalia and little Mack–to teach. I’ll tell you all about the older four, with the very slightest encouragemenet! I’m very proud of them all. I hope you do live your dream and I’m sure your happily ever after is out there! Thanks Wendy for enjoying our experience with us! This my lovely is a five***** star belter. I love the pictures and I cannot wait to try the violet syrup, It’s new to me I think it might go down well in a cocktail. We shall construct one and name it after you ! I love that idea, Anita-Clare. Hopefully you have some beautiful wild violets growing there, across the pond. Beautiful (if painful) ramble. I’m going to post this one on my blog’s Facebook fan page. I haven’t had that kind of walk in many years. Wow, Alana, thank you very much! I’m glad you enjoyed our painful-yet-memorable ramble in the woods, if vicariously. Again, thank you for the FB fan page posting–I owe you one!